Slimmed-down TV chef's healthy lifestyle tips Jump to media player The Michelin-starred chef lost nearly 12 stone after he decided he needed to turn his life around. 'Cookery shows make restaurants better' Jump to media player Chef Tom Kerridge says customers have higher expectations because of what they've seen on TV - and food quality has improved as a result. 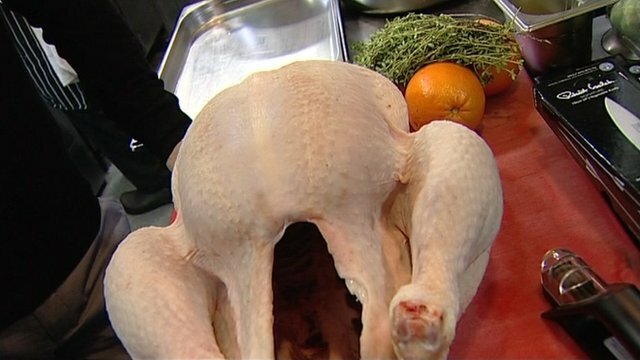 How to cook a Michelin star turkey Jump to media player Richard Westcott has been getting some tips on how to take the stress out of Christmas dinner from a Michelin star chef. The scotch egg renaissance Jump to media player What became of the humble scotch egg? Egg judge David Constable and Michelin star pub owner Tom Kerridge gives his opinion. 'Michelin star standards about chef's ego' Jump to media player Ade Edmonson wins Celebrity Masterchef with a dish worthy of a Michelin star. 'We were in the right place at the right time' Jump to media player Robert Jakobi, who turned Metcalfe's Skinny popcorn into the fastest growing food brand in the UK, credits good timing for his success. 6 Minute English - 192021 - Are food allergies more common now? Jump to media player Is it easier to develop a food allergy these days than it was in the past? Neil and Rob discuss food allergies and teach you vocabulary. Michelin-starred chef Tom Kerridge once weighed 30 stone. A few years ago, when he was approaching 40, he decided he needed to dramatically change his eating, drinking and exercise habits if he wanted to live for the next 40 years. He lost nearly 12 stone. Watch the video to hear his five tips for a healthier lifestyle and how he adjusted his approach to food and exercise to lose weight. Tom Kerridge was a guest on Woman's Hour on BBC Radio 4. Listen to his full interview here.